Air Power by Enzymatic Therapy opens my air waves without the jitters..Also helps control my cough. I use Air-Power by Enzymatic Therapy whenever I begin to feel stuffy in the nose or head. It works great! I like that Air-Power by Enzymatic Therapy doesn't have a lot of harmful additives like over the same over the counter medicine does. 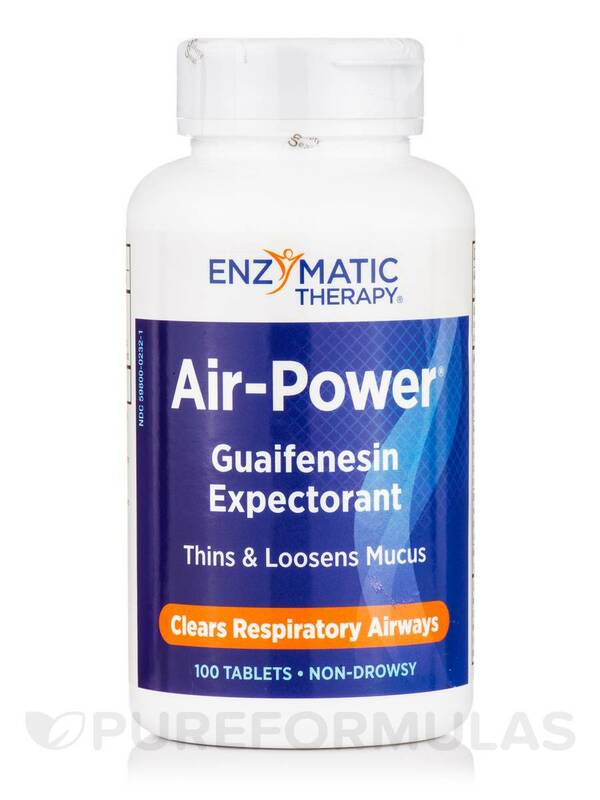 Air-Power is a dietary supplement by Enzymatic Therapy may possibly help support a healthy respiratory tract. 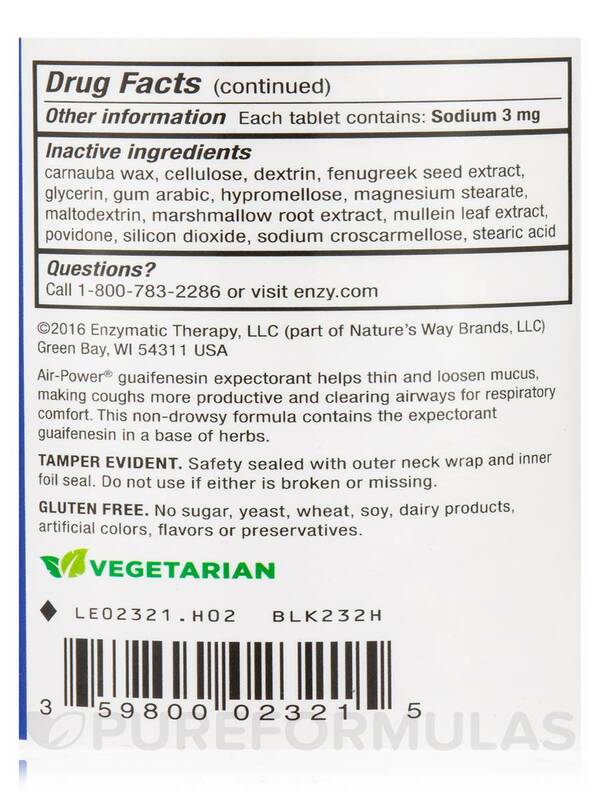 Guaifenesin (Glyceryl Guaiacolate): Is believed to help improve the respiratory tract. Guaifenesin might be able to act as an expectorant by possibly helping in loosening phlegm and other bronchial secretions in the lungs and trachea. It may encourage the secretion and flow of phlegm upwards towards the pharynx. Guaifenesin might possibly also help relax the muscles‚ and aid in reducing chest congestion—caused by allergies and common colds. This Enzymatic Therapy formula can be taken to help relieve chest congestion so you can potentially breathe better when you’re out or at work. Before taking Air- Power‚ please consult with your doctor to see if this supplement is suitable for you. 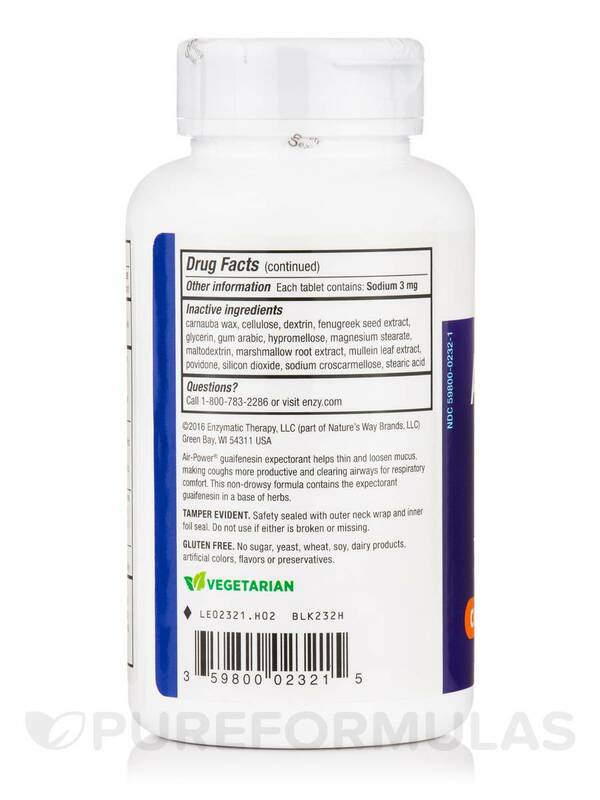 Inactive Ingredients: Carnauba wax‚ cellulose‚ dextrin‚ fenugreek seed extract‚ glycerin‚ gum arabic‚ hypromellose‚ magnesium stearate‚ maltodextrin‚ marshmallow root extract‚ mullein leaf extract‚ povidone‚ silicon dioxide‚ sodium croscarmellose‚ stearic acid. No gluten‚ sugar‚ yeast‚ wheat‚ soy‚ dairy products‚ artificial colors‚ flavors or preservatives. 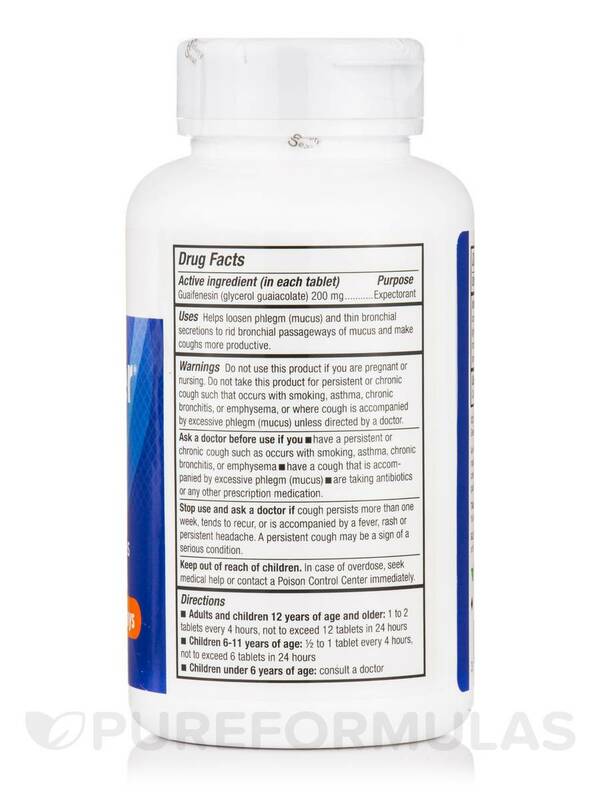 Adults and children 12 years of age and older: 1 to 2 tablets every 4 hours‚ not to exceed 12 tablets in 24 hours. 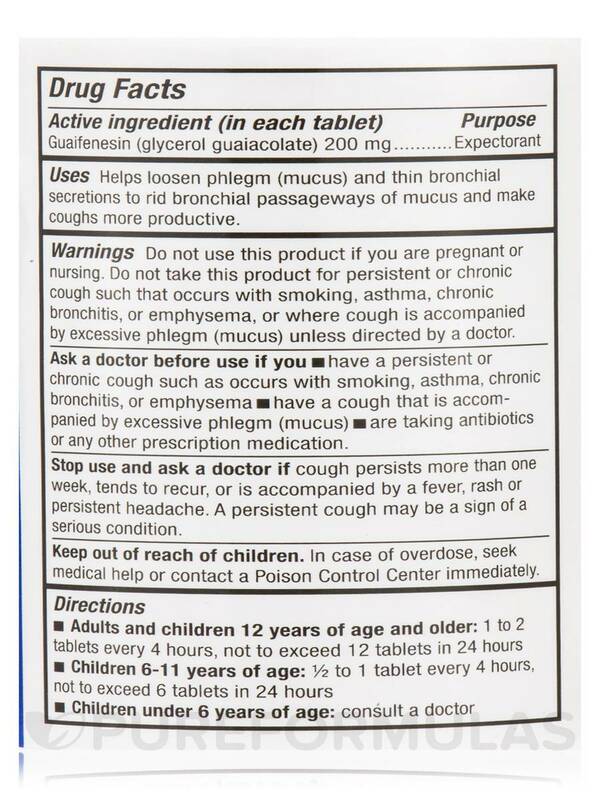 Children 6-11 years of age: 1/2 to 1 tablet every 4 hours‚ not to exceed 6 tablets in 24 hours. Do not use this product if you are pregnant or nursing. Do not take this product if persistent or chronic cough such that occurs with smoking‚ asthma‚ chronic bronchitis‚ or emphysema‚ or where cough is accompanied by excessive phlegm (mucus) unless directed by a doctor. Ask a doctor before use if you have a persistent or chronic cough such as occurs with smoking‚ asthma‚ chronic bronchitis‚ or emphysema‚ have a cough that is accompanied by excessive phlegm (mucus)‚ are taking antibiotics or any other prescription medication. Stop use and ask a doctor if cough persists more than one week‚ tends to recur‚ or is accompanied by a fever‚ rash or persistent headache. A persistent cough may be a sign of a serious condition. In case of overdose‚ seek medical help or contact a Poison Control Center immediately. Tamper evident. Safety sealed with outer neck wrap and inner foil seal. Do not use if either is broken or missing. Consult a doctor for children under 6 years of age. This Air-Power by Enzymatic Therapyworked really well when I was sick. It cleared out the deep congestion and help me breathe without terrible additives and preservatives like many other brands have. No artificial additives and works great.